Cameroon volcano - A description of Cameroon volcanic line. Cameroon volcano is a result of Cameroon volcanic line (CVL). 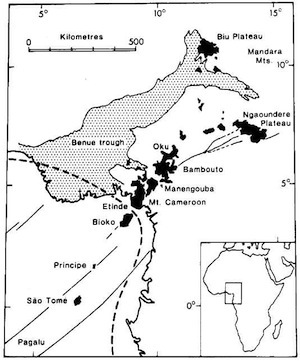 Cameroon volcanic line extends over 1600 kilometers consist of a string of volcanoes extending from Atlantic ocean (- from St. Helens, Pagalu, Bioko, Principe, and Sao Tome) to continental segment in Cameroon ( Mount Cameroon, Mt. Manengouba, Mount Lefo, Oku Mountain, Ngaoundere Plateau, Mandar Mountains Biu Plateau and lots more. ). Since Cameroon volcano go through oceanic - continental boundaries the are subjects o intensive scientific research and interest. Prominent on Cameroon volcanic line is Mount Cameroon (aka Mt. Fako, Buea Mountain). Mount Cameroon eruptions occured in 1909, 1924, 1954, 1959, 1982 and 1999. Hanno from Carthage in North Africa (Tunisia). Mount Cameroon Eruptions. 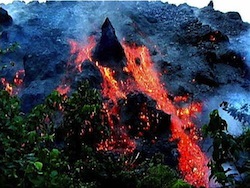 Volcanic Activity on - Cameroon Volcanic Line. 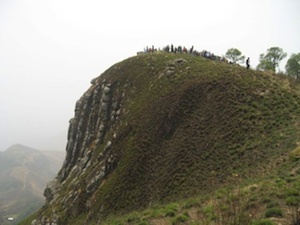 Other noteworthy consequences of Cameroon volcanic line are the deadly release of toxic gas by Lake Nyos Cameroon (1986 - killing 1746) and Lake Manoun Cameroon (1984 - killing 37). These lakes are part of what has been referred to as the world's three killer lakes. Lake Kivu being the third. Do you have a great story about this topic to share? Share it here! @ Copyright Cameroon-today.com. All Rights Reserved.